A long-time participant in programming, Leila Williams' life and educational experience go far beyond her years. Leila's involvement with UNYA goes back to when she was just 12 years old, and began a mentorship with our Mentorship Program. Leila became regularly active at the Native Youth Learning Centre (NYLC) and participated in one of UNYA's very first Spring Break Basketball Camps, a skills development camp organized and facilitated by our School Support Program. The support that Leila received from her mentor, and from others in the community have inspired her to in turn become an agent for change for other youth, and to help others in the same way that she has been supported. Driven to give back, Leila moved from program participant to volunteer when she completed a practicum placement at the Native Youth Learning Centre, as part of a Native Education College program. Leila knew that she wanted to serve on UNYA's Board of Directors from the moment she turned 19. She is now in her fourth year as a youth member of the board, and is invaluable in ensuring that youth perspectives and input continue to play a major role in our governance. 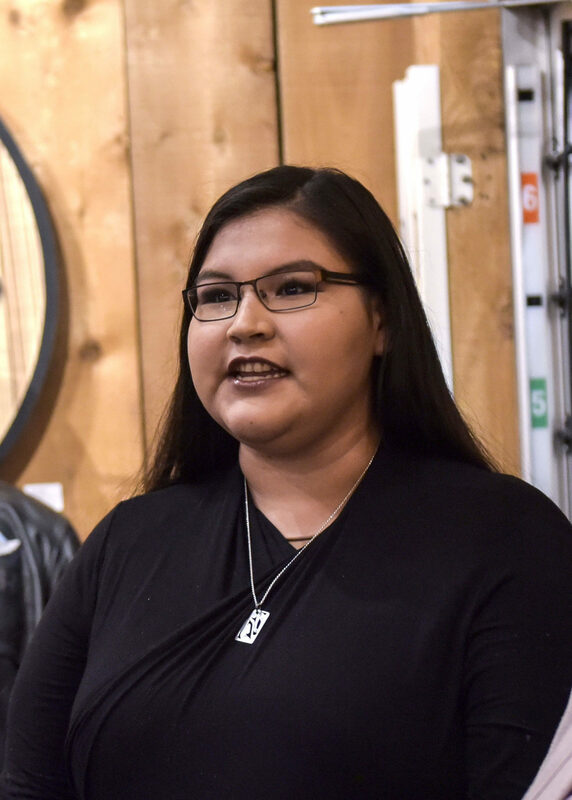 Despite being the youngest member of the board, Leila takes on a great deal of responsibility, acting as Board Secretary, and stepping forward to represent UNYA and advocate for Indigenous youth whenever possible. Leila is dedicated to being a positive role model, to learning about and sharing her culture, and to giving back to her community. On top of being an UNYA board member, Leila is a friend of the board" (youth advisor) for the Pulling Together Canoe Journey Society, has served on the youth council for the Cultural Connections for Aboriginal Youth Initiative, and has been a youth leader at Collingwood Neighbourhood House. The support Leila receives from her family, her desire to be a good example for her niece and nephew, and her commitment to breaking down cultural stereotypes are what drive her to work towards positive change in the community. Leila closely collaborated with other youth participants and staff in 2012 to create powerful violence prevention posters and other dynamic, youth-focused resources through UNYA's Sisterwork: Agents for Change initiative. What are Leila's goals for the future? She wants to help others in the same way she's been supported. She's so grateful for the support of her grandfather, who's kept her on a good path and ensures that she stays involved in her culture. She's also keen to become a volunteer mentor one day - and would be the first youth to come full circle, starting as a youth participant and stepping into an active mentorship role for another youth. Drawing from her life experience (she's been a child in care of the Ministry) and education, Leila would eventually like to start a youth program in collaboration with her boyfriend. Having experienced all sides of programming as a participant, a youth worker, and administrative support, she has an amazing skillset and a ton of knowledge to share with youth and staff. Given their direct experiences as youth themselves, particularly as participants who have accessed a wide range of community programs, they know the ins-and-outs of programming and understand how to respond most effectively to meet youth needs. As a young Indigenous leader, Leila is dedicated to being a positive role model, to continuing to both learn about and share her culture, and to give back to her community. Culture forms a big part of her life. Leila regularly visits her home community of Moricetown for feasts, to continue learning traditions and protocols. Are you a young person considering attending programming for the first time? Leila encourages you to not be shy! Just be yourself and don't be afraid to ask for help. You'll get to make some great new friends, and there is a supportive network of people at UNYA who will embrace you and make sure that you feel welcome valued, and supported.